Artificial intelligence (AI) in pop culture often imagines a futuristic world in which every car is self-driving and every home has a robot butler. The advertising industry has been applying machine learning (ML) in a more practical way. We’ve become fairly sophisticated with ML-driven programmatic digital ad buying and chatbots now guide customers to their goals from conversations. The next challenge? Bridging hard data with this seemingly nebulous technology in order to improve customer experience (CX) management. Increasingly, superior experience is becoming the key driver in consumer brand affinity. AI is one tool for creating brilliant, unique, and personalized experiences that delight users and build loyalty. And to fuel a strategic AI-CX marriage, you need robust, insight-driven data. Most brands – even cutting edge, innovative companies – start with their data and technology siloed. Decentralized measurement creates disjointed marketing channels, where each brand message stands alone online, on a billboard, or in your store. To stand out in a tech world with one-to-many communication, your brand must provide a seamless experience across all of your customers’ favorite channels. Machine learning tools discover patterns in customer behavior, and when employed with high-level marketing strategy, one-to-one brand offers for each individual are possible. One of the champions of AI is Amazon, which first delivered personalized product recommendations that now account for 35 percent of its revenue. By combining data from individual customer preferences and purchases, its AI can offer related items or groups of products regularly bought together. Now the company is scaling beyond the online experience to integrate Alexa searches and Amazon Go store purchases to track customer shopping trends and offer products across channels. To bring similar results to your brand, the company now offers an AI tool called Comprehend. This natural language processing service gleans insights and relationships in text, including social media posts and emails. It scores overall sentiment and extracts tokenized phrases to aid in conducting voice of customer analysis and personalizing content in web applications. 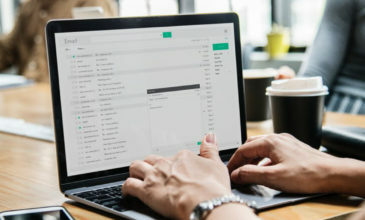 All brands begin at the “Developing” level of CX maturity, in which data primarily serves to report web traffic or click rates for blast email campaigns. These metrics can help diagnose your current communication practices, which is a great foundation for building targeted customer experiences. At the “Emerging” level, your brand’s digital practice is a bit more advanced, and you likely have a good grip of audience segmentation, tying analytics to KPIs, and testing and optimizing within channels. Your data at this stage is likely to help define opportunities and solutions, which involves expanding digital channels to meet more of your customers’ needs. 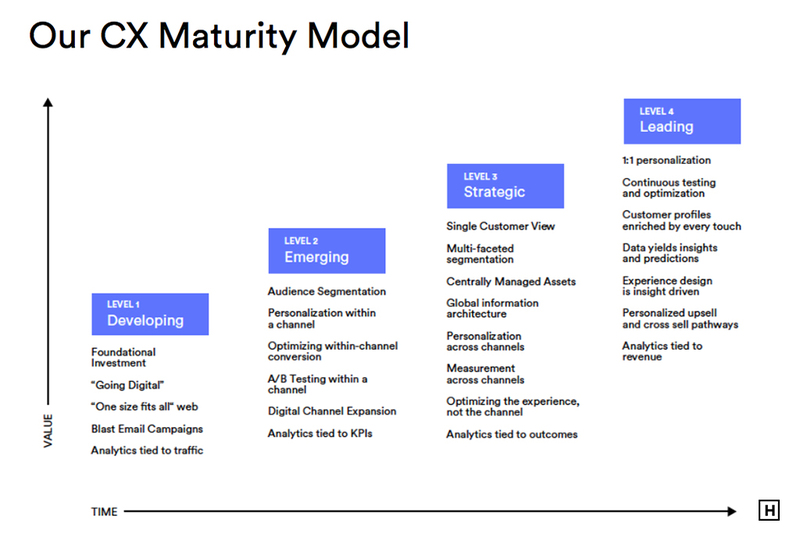 The next levels of CX maturity, “Strategic” and “Leading,” involve organizing data to activate identified solutions and predict future behaviors or needs. In “Strategic” CX, you’ve adopted a single customer view and have a strong grasp of executing multi-faceted segmentation across channels and measuring outcome-related analytics. Sophisticated machine learning pushes your practice to the next level, “Leading,” to implement 1:1 personalization, insight-driven design and selling, and touchpoints that enrich each customer’s experience. AI can be integrated into any of these four stages, but true brand transformation occurs in the latter phases of CX maturity with sophisticated data organization. Due to legacy practices and cultural obstacles within organizations, progress toward the integration of data and technology is often incremental at best. Implementing AI solutions in the earlier stages of CX maturity helps you make a case for the technology’s return on investment; historical data facilitates marketing spend forecasts and breaks down some of the cultural obstacles to getting top-level buy-in for company-wide integration with more speed and less resistance. 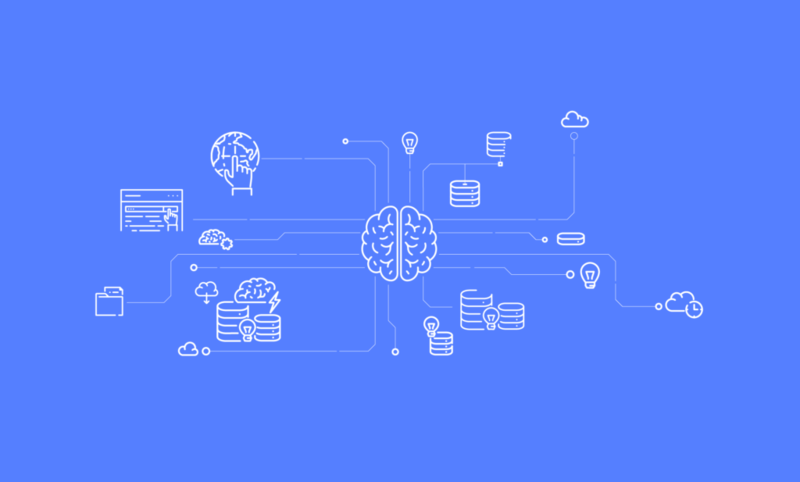 Understanding your audience through machine learning is an easy first step to shift your focus from general marketing offers to delivering personalized incentives across channels. As early as the “Developing” level of CX maturity, you can bring in a relatively simple AI tool that synthesizes analytics across channels and enhances voice of consumer analysis. This fuels deeply sculpted audience segments based on demographic and psychographic information, and online behavior that bring you into the “Emerging” level. As the technology facilitates deeper targeting, you can create customer experiences that are one-to-some as opposed to one-to-many. This of course is only scratching the surface of CX personalization. With multichannel data at your fingertips, you can develop an achievable roadmap to moving into the “Strategic” and “Leading” capabilities of seamless integration between platforms. Taking your brand to the next level involves a sophisticated data approach as well as departmental channel collaboration in your organization. With silos dismantled, your organic data and AI extrapolations can be consolidated and activated within a customer data platform (CDP). 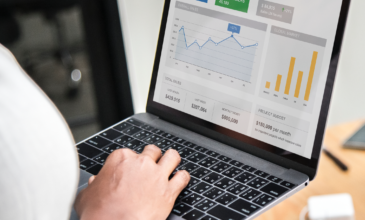 A clearer understanding of analytics based on cross-channel engagement empowers you to conduct one-to-one customer experiences that are optimized based on the customer, not the channel. Measurement of specific, integrated outcomes with AI technology increases your efficiency in delivering always-on streams of rich, relevant experiences. In turn, metrics that truly reflect each individual’s reaction to personalized CX touchpoints fuel even more effective, data-driven experience design. 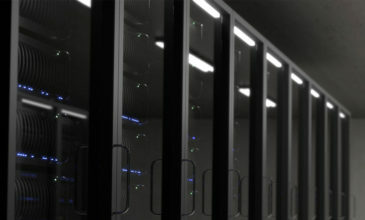 Remember that a successfully integrated experience strategy starts with the prioritization of and commitment to a world-class data technology infrastructure. Managing velocity and volume of data is the name of the game, and AI is critical in effectively delivering personalized touchpoints that create a seamless customer experience. As we embrace the future of AI, marketers must work towards unifying their data and aligning their organization to leverage all relevant data cues to guide their marketing strategies. Learn about our CX strategy and data + insights service offerings or download our 8-step guide to creating omnichannel customer experiences.